If you travel outside of Seoul like Bill and I do when we visit Korea, you will see a lot of really cute Ssam-bap restaurants in the countryside. It is like a staple country food dish. While many restaurants serve the dish with a small plate of meat these days, the main focus is on the Ssam. Ssam (쌈) means “wrap” in Korean. 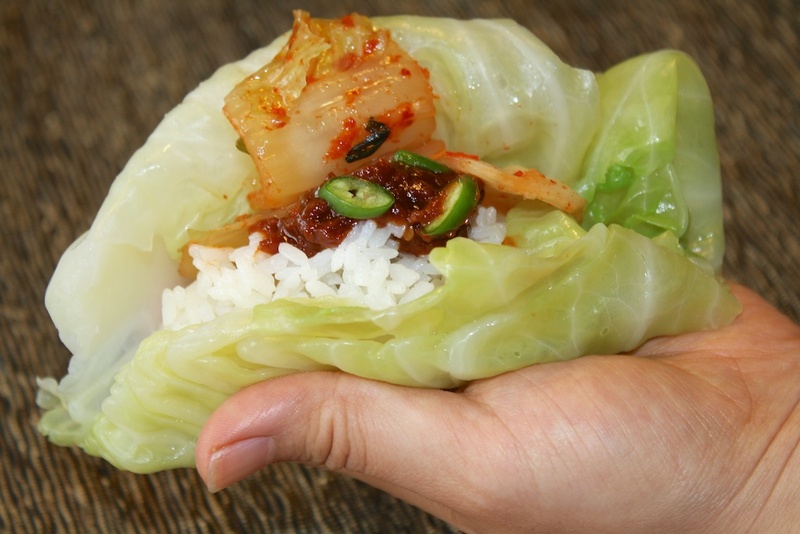 So you use various leaves as a wrap to wrap rice and ssamjang (wrap sauce, a yummy bean paste). This is another great Korean peasant food dish. Very simple yet satisfying. The funny thing is that nowadays these peasant dishes are served at classy, up-scale han-jung-shik (Korean full meal) restaurants, as they are considered healthy, well-being food. We have it when we are being lazy and don’t want to cook. It’s not fancy but its healthy, easy, and satisfying! 1. Make white or brown rice. Prepare ssamjang and kimchi. 2. Clean korean green peppers, perrilla leaves, red lettuce and cabbage leaves. Leave all of the leaves whole and slice the peppers. 3. Steam cabbage until the leaves start becoming clear, but not mushy- takes about 15 minutes when I cook them! 4. 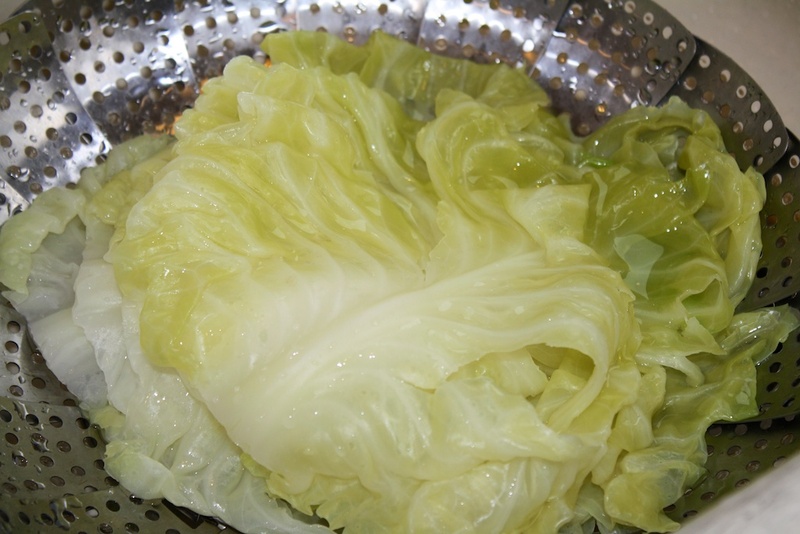 Rinse the steamed cabbage immediately in cold water so it stops cooking. If you don’t rinse, it will keep cooking and will be over cooked. It will not taste good! 5. 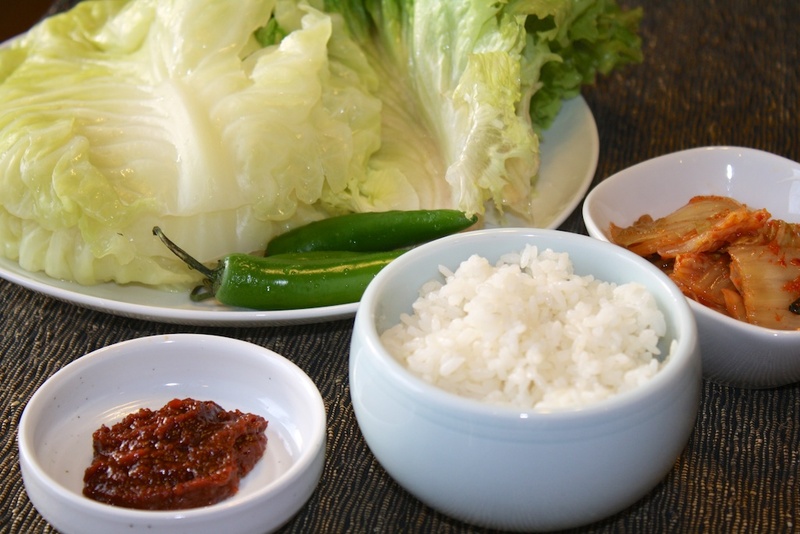 Arrange the korean green peppers, perrilla leaves, red lettuce and cooked cabbage leaves on a plate and serve with rice, ssamjang and kimchi. This is the ssamjang that we use. This is a Haechandle brand, but “Soonchang” makes a good ssamjang too! Steam the cabbage until slightly translucent, but don’t overcook! Rinse with cold water right away to stop the cooking. You can mix and match what leaves you use and even combine them. 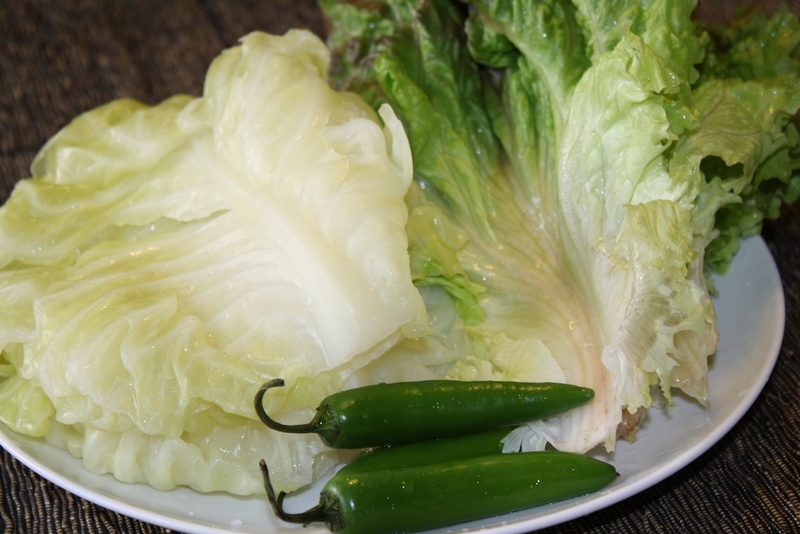 We sometimes like to place a perilla (kkaennip) leaf inside of a lettuce or cabbage leaf when we make wraps. Wrap the ingredients up like a taco and enjoy! 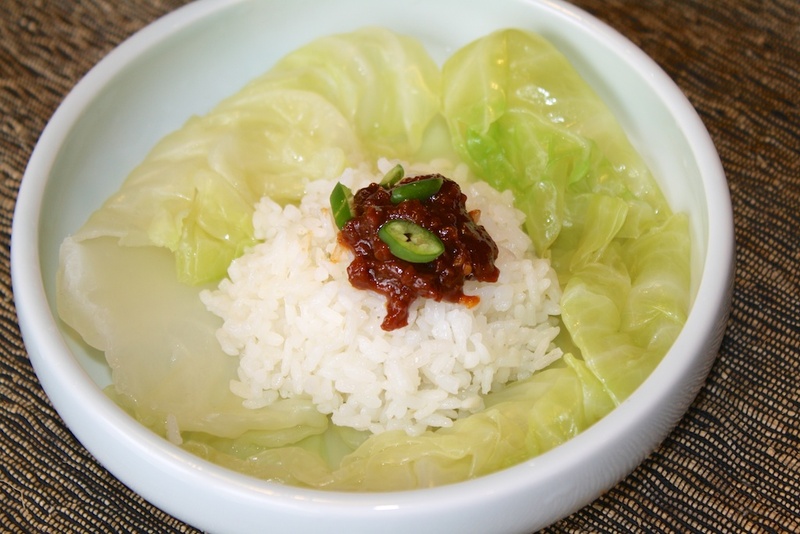 Be sure to be generous with the ssamjang – that is what really makes the ssambap! And add some kimchi if you like – makes it really yummy. Some restaurants will put it together for you like this when they serve their Ssam-bap. 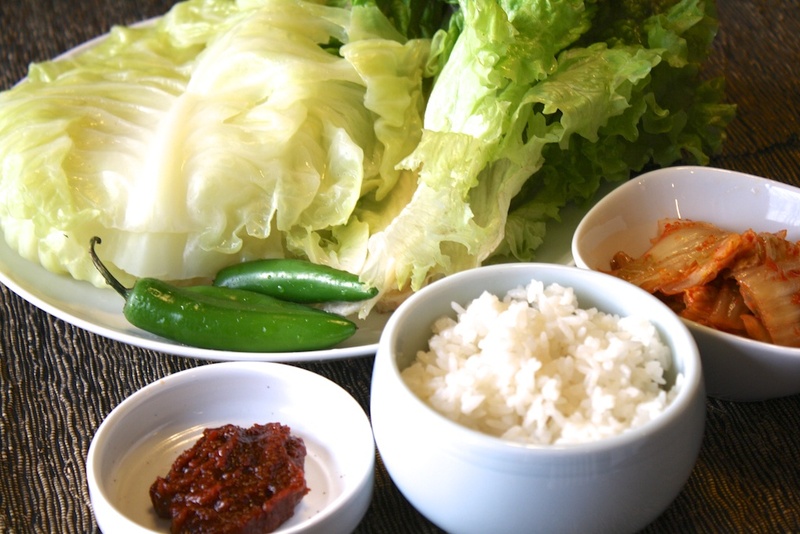 Ssam-bap: a simple, healthy, and delicious Korean peasant food! When you use perilla leaves on these, do you blanch them or eat them raw? Hi Corrin – you eat them raw! Yum yum! And so timely; I was just saying to my sister yesterday that I think one of my favorite textures for food is crispy, juicy lettuce combined with something soft, like rice or noodles. Lettuce wraps are such a great example of that. 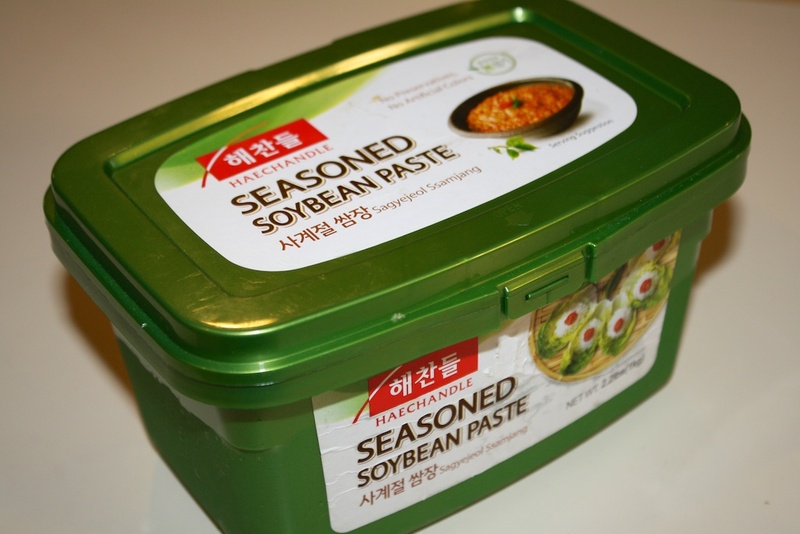 I think I have a container of ssamjang at home. I just need to pick up the right kind of lettuce and Korean peppers. mmmm. Thanks! p.s. Do you still have a garden where you live now? I remember that you used to grow perilla leaves in your garden. Hi, Lu! 😉 Hope you enjoy it. We have a tiny garden in our new house’s backyard. We were a little sad to lose our big garden, but we are definitely planting perilla leaves every year! They are super easy to grow and don’t need a lot of land at all. Growing them in a pot is certainly feasible too! Hi, Cat! Great point, some ssamjang’s have the oil in them but not all do, so you can always add it too. Thanks for visiting! Yum! I am getting hungry looking at these pictures. Thanks for this great recipe. I have been growing perilla in the back yard and it is nearly ready to start eating, so I am going to try this. Haha… 🙂 I love growing perilla. It’s so easy and it smells great too.